I have purchased from this company several times. There frames are professionally done and it’s easy to attach the canvas. Worked great. Looks beautiful. Inset design is modern and cool. Amazing frame. Very well made. Timely delivery and in perfect condition. Suited the painting my wife did very well. We've used used your frames for years and continue to be satisfied. This frame was simple to use and the canvas looks finished The included hardware is just right for creating the floating appearance. 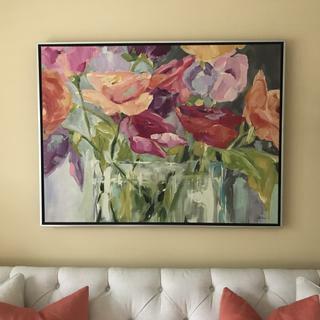 This four foot by six foot frame was priced fairly on cyber Monday however the shipping fee was more than the frame cost. I can understand that but then I got an additional bill from the shipper which really took advantage of the situation. They merely brought it to my building lobby and that was it. Extra charge bill sent to me was from shipper and was really not fair. Hello Alan. Thank you so much for being a valued customer. We are happy to know that the painting looks great! We apologize for the inconvenience you experienced with our carrier. Being that the frame was so large, the oversized carrier fee was charged prior to the order being shipped. We ask that you please email us a copy of the invoice you received from the carrier. Please email that to customercare@pictureframes.com- attention Shea. We are happy to accommodate you the best we can. Thank you for allowing us to make this right. Happy Framing! I Love <a href="http://pictureframes.com" target="_blank">pictureframes.com</a> ! I have been purchasing frames from this company for many years now and have never been disappointed !!! The frames are superior quality and prices are very fair and reasonable. The frames are meticulously wrapped before shipping and always arrive in perfect condition. I have purchased frames from other companies in the past but this company is by far the best !!!!! This frame is perfect for the art I selected. I was not familiar about floating art but this worked out great. And, compared to my local framer, this was much more reasonable and I saved Considerable dollars. This frame was exactly how it was pictured. It was packaged in a way that damage to it would have been extremely difficult. I think it was a very good value and I am very pleased with it. I will definitely order this again! Looks great for the money. Would have costed much more at Michael’s. Liked the frame shipped to my home as it was oversized. Had some questions answered by customer service. They were very helpful. Would buy from them again. Had great customer service when deciding which frame to purchase. They were super helpful explaining how to measure for the frame. The frame is good quality, easy to assemble and looks great! Aaron Brothers quoted me $535 for the same frame, and I spent about $100 (which included S&H) through pictureframes.com. And they're made in the USA! SOOOO happy to have found this site. The floating frame gives new life to the painting. Great customer service! I love my framed photo - you were able to frame to the size I requested and within 6 days. Just what was needed to give the art a more finished look. 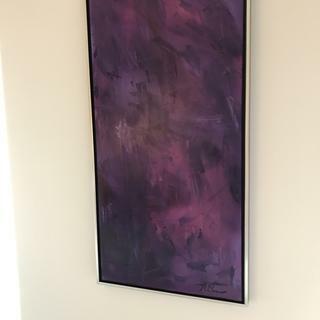 I would have given five stars but several pieces of the hardware to hang the picture were missing. The price and timing are great! The dimensions were on the roomy side which made centering the artwork in the frame a time-consuming hassle. I tried to call to see what my options were for having the frames re-made but couldn't get through. I was in a rush so made the best of it but will want re-assurance that the frames will be constructed to fit the art more precisely next time. Hi Betsy. Thank you for your review. We appreciate your feedback and are happy to have another opportunity to serve you. 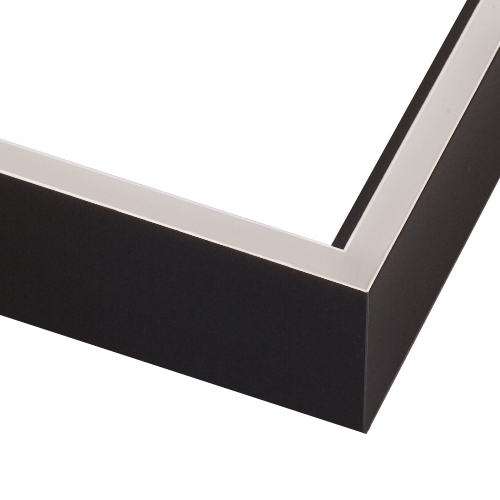 As a framing standard, we do add a 1/8" allowance to all of our frames. If you would like your order placed without the allowance, please give our care team a call at 1-800-332-8884 to order. This will ensure the exact artwork size is cut and that no extra space is needed on your order. Thank you again and have a great day! Again, good quality, great value. But I'd like to see more options on the color, instead just sliver or gold. What about antique glod? It is gold but very subtle. Or matt burnt orange/earthy red? Hello Ning. Thank you for giving us more ideas on what colors we should use to bring out the beauty of the Floater Frame Collection! Your feedback has been placed in our discussion forum that is viewed by our head of Marketing. Please continue to let us know what frames you visualize seeing your artwork in. Thank you for taking the time to give us this insight. Happy Framing!! Had help from one of your agents. Nice gal. IT'S THE PERFECT FRAME FOR MY ART WORK, THANKS FOR THIS GREAT PRODUCT. Elegant and immersive! Unique but not too flashy. To coordinate with both my artwork and dÃ©cor. I am using this frame on my entire body of work this season. Looks best with my work. I'm doing my entire show with the black and silver float frames because they look best with my paintings. The frame fit the theme of my painting perfectly. The style is durable enough to handle the rough travel to multiple art shows. I chose this frame because I already have black and silver frames in the room but also because it's a deep profile (1.5" rabbet). Purchased this before and it worked perfectly. this is a first time experiment as I need a normally unframed painting to be shown in a gallery. Hope it works! Love the price point and the silver black combination. I have two beautiful tower painting by the same artist on canvas. The Silver is for the red roses. Tthe painting has bits of silver highlighting. thereby tying the two together. Ordered previously. Beautiful. Great quality and price. 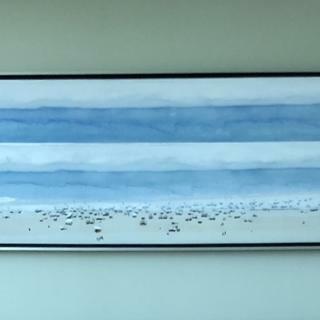 I like the contemporary edge, and this color goes best with the art piece. In the past I have used the canvas floater frames and they have been very easy to work with and the craftsmanship has be excellent. Custom order for client. The frame matched the photograph and the dÃ©cor of the room. I have used this frame before and was very pleased. Will this be alright for a 3/4 inch deep canvas? BEST ANSWER: Hello! This frame is meant to fit a canvas 1 5/8" in depth. Please consider the CF3 frame instead which has the same profile but a depth of 11/16". Thank you for your inquiry! I have a few paintings on wood that I would like to put in a floater frame. The paintings are on the smaller side but the depth of the wood is either 2" or 3". How do I tell if your frames will work for paintings that depth? BEST ANSWER: Hello! Thank you for your inquiry! Please look at the depth/rabbet of the Frame to determine if the frame will work with your paintings. If you need more assistance, please give us a call. We can be reached at 1-800-332-8884. 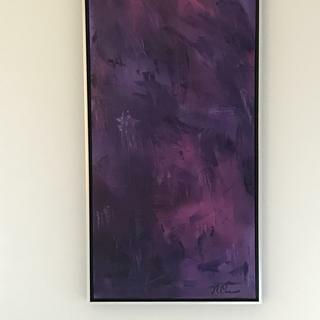 I have a canvas I'd like to frame in a wood floater frame but it is mildly warped (rocks slightly when on flat floor) would I be better off with a stronger metal floater frame? BEST ANSWER: Hi Lisa! Thank you so much for your inquiry. Our Wood and Metal Floater frames both have great stability to hold a standard canvas. Since your canvas is warped, could you consider adding a support brace to the back of you canvas to straighten the stretcher bars? Please keep in mind that the installation of the canvas provides stability as well. However we can not guarantee that the frame will not still appear to be warped. Installing your canvas inside the frame requires screwing through the stretcher bars to attach to the frame. Please let me know if this information is helpful. Have a wonderful day. I am looking for a deep shadow box floater frame Approximate depth of 3-4 inches and about a 3/4 to 1-inch face to make a 30x44 box ? Thank you for reaching out to us. We have the Shadow Box frames and also the Floater Frames. Both styles are available in various depths. Depending on the artwork you are framing, will determine if you need a Shadow Box or a Floater frame. For canvas we recommend using the Floater Frames. For framing memorabilia we would recommend the Shadow Box Frames. I have attached an image of a Floater Frame (CF3) that has a depth of 11/16". I have also attached an image of our Shadow Box Frames (SP8). Please let us know if you need any further assistance. Have a great day! Hello Shea, The image is printed on Metal and is 20x30inch printI want a frame 30 x 40 in shadowbox with foam core backing to mount this image into. White with silver would be Ideal. And I would like the walls of the shadow box to be 3-4 inches tall I have attached an image of the print front and back to help figure out the best way to go. The metal print will appear to float inside the shadow box. I like the clean flat edges of the CF3.... but would like it a deeper and wider than the CF7... preferably in white with a silver face. Hello Brian! Thank you for the details and providing the visual of the artwork. What a unique idea! We can accommodate the 30"x40" width and height you need, but at this time our shadow boxes have a maximum depth of 2 1/2". This depth will still give you an awesome presentation. Our Super Canvas Woods Collection has both white and silver frames and are ideal to create a one of a kind shadow box. If you consider having a frame will less depth, we can get the order going for you today. Please let me know if this information was helpful. Have a great day! Hello Shea, The image is printed on Metal and is 20x30inch printI want a frame 30 x 40 in shadowbox with foam core backing to mount this image into. White with silver would be Ideal. And I would like the walls of the shadow box to be 3-4 inches tall. May I order this frame unassembled? BEST ANSWER: Hello James. Yes, you can order the frame unassembled. Please make this request by calling our customer care department at 1-800-332-8884. Thank you for your inquiry.